Manila bound BLTBCo, circa 1962. Image credit: History of Batangas on FB, c/o Jigger Gilera, MD. These days, one can travel to Metro Manila in airconditioned buses with decent enough leg room and head rests high enough to be comfortable for Filipinos of above average height. The roads are also well-paved, so the days of bumpy rides are long gone. As everyone knows, however, there is always a trade-off; and these days, despite the pampered comforts of bus travel, the downside is that the roads are frequently jam-packed with vehicles. Still, bus travel has evolved almost unrecognizably from what it used to be when I was a small boy in the early sixties, when buses looked better suited for transporting cattle than people; and roads were roughly paved with gravel and asphalt. I became acquainted with bus travel at an early age because my mother used to take me along when she went to market in Batangas City or Lemery, where she always insisted the fishes in the wet markets were always fresher than those in Lipa City were ever going to be. 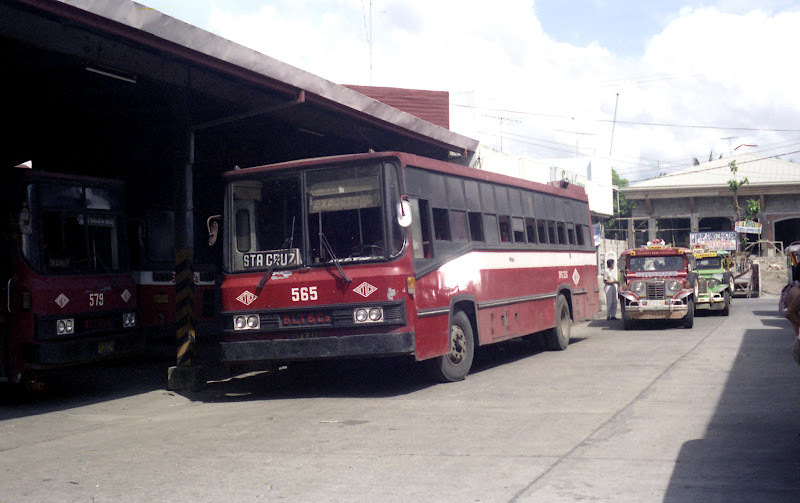 The main rivals along the Manila-Batangas City and Manila-Lemery routes were BLTBCo and United Bus Lines; and things got particularly hairy when their buses raced each other along the uneven roads to get to passengers first. My earliest memory of buses back in the early sixties was these ugly wooden monsters that had wooden seats laid out in rows. Upholstery was non-existent and leg room was minimal. Conductors hung like gymnasts outside the bus to hand out tickets and collect fare as the buses tore down the roads. 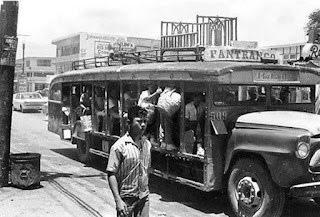 The first buses I rode were similar to this vintage PANTRANCO bus. Image credit: Manila Nostalgia. When it rained, depending on the bus, if you sat by the window side, you either pulled up a wooden window or pulled down a tarp. At the door side, it was always a pull-down tarp, which made it tricky for the conductors to move from door to door. They protected themselves from the rain by wearing bright-coloured ponchos; but they always got wet, nonetheless, if the rains were hard. A variant of these buses served the BLTBCo line from Batangas City to Nasugbu. My uncle, who used to live with us inside Fernando Air Base during the week but went home to Nasugbu for weekends, used to call these variants “kusina” (or cocina). I never quite figured out why, although at the rear of the bus was a box-shaped space where the seats were laid out facing each other, leaving space in the middle for cargo. This space, I believe, was what was called the “kusina.” It was space for both passengers and cargo; and I had ridden there with my uncle when we had for company goats and chickens brought along by other passengers. 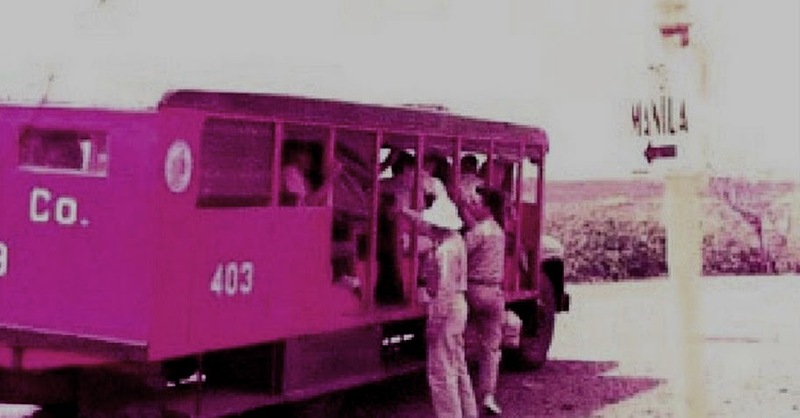 BLTBCo and United Bus Lines buses along the Taal-Muzon road, circa 1958. Image credit: History of Batangas on FB, c/o Jigger Gilera, MD. By the seventies, BLTBCo started to introduce what everyone referred to as “streamline” buses; and I never really discovered why they were called that way. These were rectangular buses with metallic bodies and just a singular door at the middle. 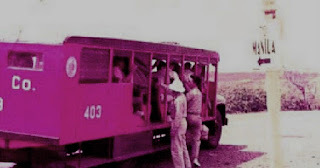 The first of these were the 200 and 300 series which BLTBCo operated along the Manila-Batangas City and Manila-Lemery routes. These were already an upgrade over the rickety old wooden buses; and the seats were upholstered with headrests, albeit not high enough to be comfortable for those of my height. Before long, the company introduced the 400 series, which were not only longer but also wider. These were still in use as recently as the eighties and probably even the nineties, although I am not entirely sure about this. As for United Bus Lines, it just quietly went away, probably unable to compete as new franchises began to appear on the roads such as JAM Liners. Eventually, even BLTBCo would cease to exist, unable to deal with the competition who were offering better buses and service. 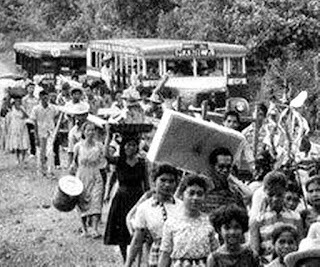 It must be in the late seventies or the early eighties when airconditioned buses first started to appear; but even these were not the immediate hit I imagined they would be. First of all, the fare was higher; and Batangueños with their “aremuhunan” (loosely translated, practical) culture would often go for the cheaper option in getting from Point A to Point B. The 400-series buses of BLTBCo looked like this. Image credit: John Ward's collection on Flickr. Animals were also not allowed into these airconditioned buses; so passengers who travelled with their chickens and their goats had no choice but to take the “ordinary” or non-airconditioned buses. Then there was this really amusing incident that probably explains why airconditioned buses took a while to become the norm in Manila-bound routes from Batangas. Everyone knows that it is customary for drivers to stop for people standing by the road if they look like they are passengers and if the buses are next to empty. These days, I am amused when I see passengers politely lined up at the Grand Terminal of SM City Lipa waiting for their buses to arrive. Young people probably have no idea what the scenes were like back in the day at BLTBCo’s Pasay terminal during holidays when there were too many passengers for the buses to accommodate. The ACTEX has reduced travel time from Manila to Lipa City. They would rush at buses as these arrive, tear and push at each other and climb up the windows just to get seats. Women, particularly the elderly, were often at the losing end; and if they could get onto the buses at all, usually had to stand along the aisles for the duration of the journey. Before the SLEX, it was a 3-hour journey the long way into Mayapa, Cabuyao, Sta. Rosa, Biñan and Muntinglupa. 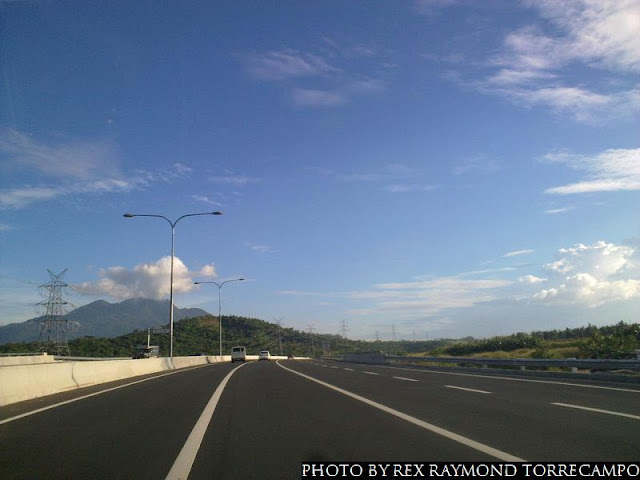 The ACTEX and the STAR along with the SLEX have all meant that travel time from Lipa City to Manila, traffic permitting, can be as little as an hour. Yes, indeed! How things have changed!